Now you can stream your own videos via Reddit - Reddit has announced it's rolling out support for native video uploads to all its users and communities. The feature has been in beta for a while and is designed to simplify the Reddit experience. Previously, videos had to be uploaded to external sites. SOUND FORGE Audio Studio Version 12 supplies everything you need to record, edit, enhance, and deliver high-resolution audio. The perfect tool to digitize, repair, and restore LP records and tapes, create podcasts, master audio, burn CDs, and render to all the popular audio formats for streaming on the web or playback on portable media players. Pro Sound Effects®released a new sound design tutorial video. Featuring the Pro Sound Effects Hybrid Library, the tutorial illustrates why a professional general sound library is critical for effective storytelling on any audio project. This video shows why having access to a professional general sound effects library is essential to bringing your audio projects to life. Learn how to sound design a tense scene from a short film - from cutting backgrounds and hard effects to adding EQ and reverb to fully bring the viewer into the world of the film. Benro is pleased to announce the new Aero 7, a compact and portable video tripod capable of supporting up to 15 lbs (7 kg). The first manufacturer in the world to introduce a travel video tripod with a reverse folding leg design, Benro’s Aero 7 is a clear evolution from its other Aero siblings. In addition to its standard ability to reverse fold to a smaller, more compact size and transform into a video monopod, the inclusion of the removable flat base S7 video head and the new 2-in-1 center column makes the Aero 7 a great traveling companion for filmmakers and videographers needing a fully featured tripod for their medium-sized rigs. Ramp and Sonic Foundry, Inc. (NASDAQ:SOFO), today announced integration of AltitudeCDN™ Multicast+ as a key distribution component of the Mediasite Video Platform. This integration advances the companies’ strategic partnership to scale delivery of enterprise streaming video applications such as corporate communications, training and live webcasts behind the firewall to Sonic Foundry’s 2,800+ corporate, government and enterprise customers. This latest version specifically focuses on strengthening the core area of audio editing. The award-winning Celemony Melodyne is now directly built into Sequoia via the ARA, while the plug-in is included in the essential version. Additional professional functions such as tempo automations, audio-to-MIDI and XYZ direct are now easily accessible to enhance workflow. NAB news - Showstoppers News - Cinamaker announced the launch of the private beta program for the Cinamaker Director Pad at the National Association of Broadcasters (NAB) conference. Highly portable multi-camera live studio with the power of a production truck, travels in a backpack, disrupting live video production. Industry Pioneers to Discuss How Advances in Light Field Technology, Volumetric Capture, and Machine Intelligence Will Impact Content Creation.Session will provide attendees with an exclusive look into how next generation imaging has the potential to transform image making for all forms of content. Stampede President & COO Kevin Kelly today challenged broadcasters to embrace drones and Drone Video Systems as the ‘selfie’ tool of modern electronic news gathering that will help them to remain relevant with today’s mobile-centric consumer news gatherers. Stampede will be hosting its Drone Pavilion at NAB 2017 at Booth C3356DP within the show’s Aerial Robotics and Drone Pavilion in the Las Vegas Convention Center (April 24-27, 2017). Designed for the latest, high-resolution digital cinema cameras and already being used by a number of cinematographers, the brand new line of Sigma cine lenses will be on display at NAB 2017. The new HTML-5 Dalet Xtend panel for Adobe Premiere Pro CC adds support for multi-sequence export, locator inheritance, configurable metadata forms for exporting content, and support for the ‘while’ scenarios when exporting from Adobe Premiere Pro. SubtitleNext provides subtitle editors and content owners with cost-effective benefits by delivering uncompromising speed and precision. SubtitleNext has been further refined to cater for the relentless upsurge of online content such as live news streaming, YouTube videos and other OTT services to benefit and support professionals. Things go from zero to “wha’-tha’? !” when Sunny finds himself in a tight spot and GERD has to rescue his little buddy. This animation is a proof of concept for a new series. This animation preview of a new series being released Spring 2017 features robo-besties, Sunny and GERD in their very first adventure as they use an interdimensional portal to clean up. What could go wrong?! 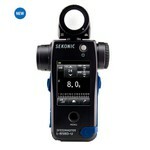 The Sekonic L-858D-U Speedmaster The next generation of light measurement control. Sekonic is proud to announce their ground breaking L-858D-U Speedmaster Light Meter is now available for purchase. The L-858D-U Speedmaster is the combination of Sekonic’s cutting-edge light measurement technology and 60 years of experience in the photographic and filmmaking industries. The meter has undergone significant design changes from previous models and has a feature set sure to meet and exceed the demands of today’s image-making professionals. SPROCKIT and NAB Show today announced the first 10 start-ups selected to participate in SPROCKIT’s 2017 program. Up to 30 emerging companies will be selected by industry leaders to participate based on their potential to offer real solutions to challenges in today’s evolving market. YouTube puts the power of live streaming in the hands of hundreds of thousands of talented creators, giving them a more intimate and spontaneous way to share their thoughts, lives, and creativity.